I’ll start off with a brief rundown of our ground tackle, which is pretty basic as we like to keep things simple. 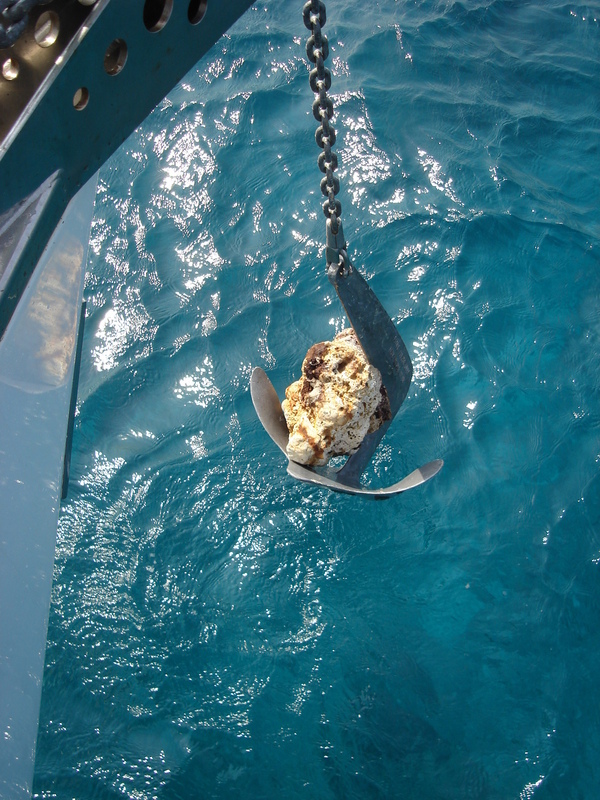 We keep just one anchor on the bow because I like to minimize weight at the ends of the boat for better performance. Our primary anchor is the original equipment on Moonshadow, a 50 kg. (110 pound) Bruce that has served us well. We’ve upgraded the chain slightly and now have 100 meters (330 feet) of 11 mm (7/16”) hi-test chain. I know I’ll probably jinx myself by writing this, but in the 13 years I’ve owned Moonshadow, she has never dragged her anchor. This probably has more to do with luck than extreme skill or caution, so I can’t take much credit. We value a good night’s sleep, so when we anchor overnight, we usually use a minimum of 7:1 scope in settled conditions. If the wind is above 15 knots or forecast to do so, we’ll put out at least 10:1 if we have enough chain and there is swing room. Paying out lots of rode doesn’t cost much, so we aren’t afraid to put out a bit extra when the situation allows. If we find ourselves anchoring in tight quarters, we’ll set the hook on a longer rode and then shorten up afterwards as space requires. We make it a practice to set our anchor by maintaining 50% reverse engine power for at least 10 seconds after the chain has fully extended and the boat has stopped moving aft. Two 35lb Viking anchors, which are aluminum Danforth style, one stowed in the forepeak and one in the lazarette. Once folding fisherman style anchor, stowed next to the batteries under the salon settee. 600 feet of one inch braided nylon rode in three pieces, with about 20 feet of chain rode attached to the one we keep in the anchor well up in the forepeak. I’m pleased to report that almost all this extra gear is in “as new” condition as it has hardly ever been used. Our snubber is made of one inch laid nylon rope, about 14 feet long. We use it whenever conditions are lumpy in the anchorage or for a bit of noise insulation against the grumbling if we’re anchored on a rocky/coral bottom. We’ve had a few experiences with thin sand over coral. The one that comes to mind is when we were in Key Largo, Florida in 1994. I pulled into what looked like a nice calm, roomy anchorage, dropped the pick, paid out sufficient scope and tried to back down and set. No joy on getting hooked. I pulled it all up and checked the anchor for debris. All was fine so I tried again. Still no joy. Hmmmm? After the third failed attempt, a nice yachtie called me on the radio and informed me that we would probably never get hooked there because the bottom was hard pan coral with very thin sand, and I might have had as much luck trying to anchor on a concrete slab. We moved to where some other boats were on anchor over a thicker sand bottom and got hooked right away. We’ve run into similar situations a few times. The only thing that has worked on a temporary basis was to pay out all of the chain and stay ready to move if the wind picked up. Rocky/coral bottoms-we’ve seen a lot over the years. I think that this is probably where the Bruce is at its best. As long as we could get a fluke to catch onto something, we’ve had almost no trouble. “Almost” I say because there are times when the anchor holds just fine, but the bottom doesn’t. We call this situation grabbing a “Bruce boulder.” In this case, lifting the anchor and dropping quickly on the bottom will usually set the object free. If not, we carry a big crowbar (a.k.a. the minor adjustment tool) to help liberate the boulder or piece of coral from the anchor. Kerr-plunk!! Stand back or get splashed. Here in the Red Sea, we’ve caught four within a month’s time! On many occasions we’ve anchored in very soft mud where it seemed like the anchor just would not set. We’d drop, pay out heaps of chain, and then back down, only to plow a big long furrow on the bottom. Sometimes we had to settle for 30% power in reverse rather than the usual 50% that we like to use when setting. The interesting thing was that a couple days later when we tried to pull up the anchor, in many cases it was nearly impossible to get it out of the mud. Hmmm? A couple of years ago, the light finally flashed on in my head. I reckoned there might just be a correlation between how long the anchor was sitting in the mud and how well it was holding. Nowadays when we anchor in soft mud, we drop the anchor, pay out the rode, and then wait a few hours for it to sink before we attempt to set it. Interestingly, our success rate has improved dramatically. We haven’t had much experience with multiple anchors or tying up to objects on land (other than Med-mooring), and have generally tried to avoid these situations due to the hassle of deploying and recovering all the tackle for a boat this size, especially if the weather turns nasty. That said, we understand that due to crowded anchorages and shifty winds in the Med, anchoring bow and stern, or tying up to rocks, trees or other inanimate objects on shore is quite a common practice. We’ve purchased a rail mount so we can stow one of the Viking anchors at the stern, and will have a big bucket with a rode coiled up and handy for such occasions. At the end of the day, we still prefer to be off on our own in a remote, quiet anchorage.